Puori 3 Health Essentials is a great solution for anyone on a quest to optimise their overall health. You get five powerhouse nutrients: omega-3 fatty acids, vitamin D3, magnesium, zinc and vitamin B6 in one convenient pack. Together they do everything from maintain your heart health and immune function to reduce fatigue. Each multipack contains a carefully chosen combination of vitamins, minerals and other important nutrients: 3 x Puori O3 softgels, 1 x Puori D3 softgel and 3 x Puori M3 capsules. Omega-3 fatty acids helps support normal brain and heart function as well as normal vision. Vitamin D helps to support the maintenance of nor,al bones and teeth plus normal muscle and immune function. Magnesium also helps to support normal electrolyte balance, energy yielding metabolism and muscle function plus it may reduce tiredness and fatigue. Fish oil concentrate (anchovy oil), minerals (magnesium gluconate, magnesium taurinate, zinc picolinate), gelatin, firming agent (glycerin), coconut oil, malic acid, bulking agent (microcrystalline cellulose), anticaking agent (magnesium salts of fatty acids), colour (caramel), aroma (natural lemon), antioxidant (mixed tocopherols), vitamins (pyridoxine hydrochloridem, cholecalciferol). For adults 11 years and up take the contents of one (1) multi-pack (4 softgels & 3 capsules) daily. Take the O3 and D3 softgels with a meal and the M3 capsules after exercise or before bedtime. Consult a doctor before use during pregnancy or for children under 11 years of age. Below are reviews of Puori 3 - 30 Daily Multi-Packs by bodykind customers. If you have tried this product we'd love to hear what you think so please leave a review. 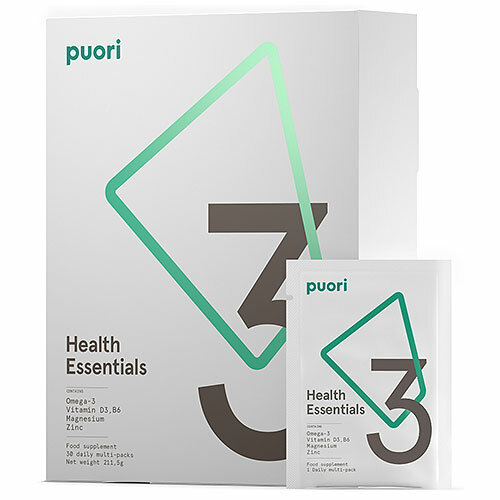 Puori 3 Health Essentials is a great solution for anyone on a quest to optimise their overall health. You get five powerhouse nutrients: omega-3 fatty acids, vitamin D3, magnesium, zinc and vitamin B6 in one convenient pack.